Early communist Russia is a fascinating period for postal history (and, indeed, for regular history) — essentially, the economy crashed and inflation ran all over the place for a few years, until it was eventually brought back under control in the mid-1920s. This led to a bewildering postal situation. The wildly unstable value of the currency required postal rates to be revised with alarming frequency (1922 saw the rates increased about a dozen times), new stamp issues were only sporadically available and generally failed to keep up with the rate changes, and attempts to stabilise the currency by creating new units of account (see above) created an additional layer of confusion. No doubt this was a highly vexing situation for all involved, but it had the side-effect of generating a lot of interesting (and generally uncontrived) cover material: excessively large frankings, overpaid and underpaid letters are all fairly common. I hope, eventually, to do a full overview of this period, taking in the stamps themselves and other matters, but that'll be a very long time coming — so for now I'll just try to present interesting covers from the height of the inflation period as I acquire them (starting absolutely from scratch here) seeing as they're the most visually interesting part of the thing. I intend not to say anything about the stamps (I'd be here all day otherwise) unless there's something particularly relevant to the cover. Ascertaining what exactly the rates were at any given point can, unfortunately, be a tricky exercise. The most commonly-cited authority seems to be Soviet Postal Rates by V. A. Karlinskii, which appeared in the Soviet journal Filateliya SSSR in 1966 (translated in issues 73 and 74 of the Rossica journal, available here). Seemingly less popular is a later work by A. Fedotowsky, also entitled Soviet Postal Rates, which was published in issue 93 of Rossica. Fedotowsky disagrees with Karlinskii on quite a few points. Karlinskii is always my first resort (any references to rates/dates are references to his account of them unless stated otherwise) but, where the two authors diverge, certainly Fedotowsky's rates seem to make more sense some of the time (though not all of the time). Worth noting also that Fedotowsky cites Karlinskii as one of his sources, so presumably he wouldn't have disagreed with Karlinskii unless he felt he had a reason for it. I would assume in any event that this confusion is chiefly attributable to the confusion that existed at the time, rather than any deficiencies in subsequent research. I'm having a little difficulty getting hold of good reference material on Russian postal markings, so probably inevitably I may miss the finer points of these on occasion. The names of the revalued currencies seem to have never really been pinned down, and they vary considerably in the literature — "1922 rouble" and "1923 rouble" seem to be marginally the most common usages but "denznak rouble" and "new rouble" are what I'm more familiar with so I use these instead. Evidently it seems to have been official policy at this point that the addressees of international letters be written in the Latin alphabet as well as the Cyrillic one, but I can't seem to find any details about this. 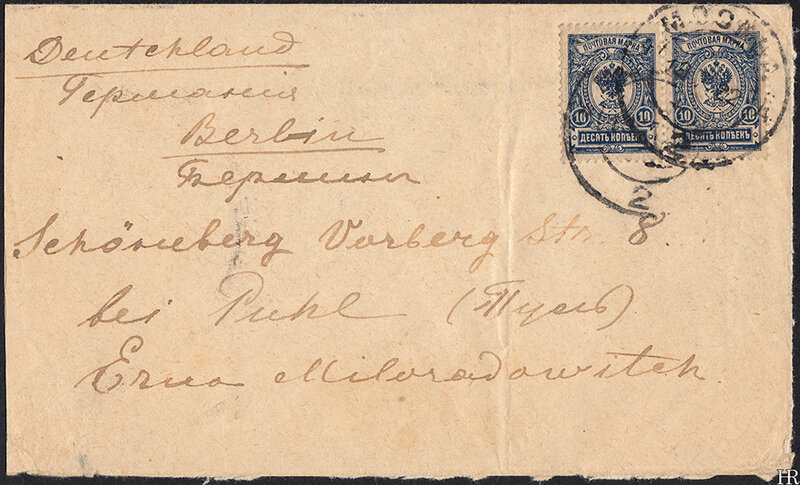 Registered letter from Kurgan to Warsaw, Poland. The administrative sub-divisions of Russia were being changed up a lot at this point: in 1922 Kurgan was located in the Tyumen Governorate (if I'm interpreting Russian Wikipedia correctly), but the registration label on the reverse still refers to the Tobolsk Governorate, which was dissolved in 1920. Anyway this was posted at Kurgan on the 5th January 1922 and was dispatched to Moscow the following day (per the oval cancel on the front, I believe), arriving on the 17th January for onward transmission to Poland. The extremely weak, blurry postmark above the registration label is perhaps (by elimination) the Polish arrival mark. The 10,000 OR franking meets the rates exactly: under the tariff of 21st November 1921 an international letter was 5,000 OR and registration was an additional 5,000 OR. The 1,000 OR stamp was the highest value of the second 1921 definitive issue (issued August-September), and, as can be seen, even it was beginning to be made obsolete by inflation at this point. The three triangles on the oval postmark indicate, I believe, that the cover was opened by censors on that date (rather than using overt censor marks the authorities used secret marks on normal postmarks, as I understand). I assume the destination —a country the Bolsheviks had been at war with until the previous year— made somebody nervous. Unfortunately reduced letter from —I thiiiiink— Simbirsk (now Ulyanovsk) to Kazan or thereabouts (going off the postmarks — I can't read Russian cursive), posted on the 18th January and arriving on the 30th. This cover is franked with a single 3 OR control stamp: in order to cope with shortages, certain non-postage stamps were granted postal validity from the 15th August 1921 and assigned a nominal value of 250 OR. I should note here I have no idea what the actual intended purpose of control stamps was —evidently they were a fiscal of some sort, but beyond that I got nothing— at any rate anyway this is one of them. Toe to tip, this is a control stamp. Under the tariff of 15th August 1921 (coming to the end of its life by January 1922) the rate for an intercity domestic letter was 250 OR, so this has been paid correctly. I don't think control stamps are especially scarce on cover but one sees them less frequently than postal savings stamps on cover, anyway. This one is beyond me: in the absence of an arrival postmark I must throw up my hands and admit I can't read the destination of this one. If anybody reading this knows where "3geec" is, please do get in touch. Anyway wherever this was sent to was somewhere domestic: here we have a 10 kopeck savings bank stamp, in its capacity as a 250 OR postage stamp (see above), paying the internal rate of the period. The envelope is a slightly less unwholesome colour in real life. 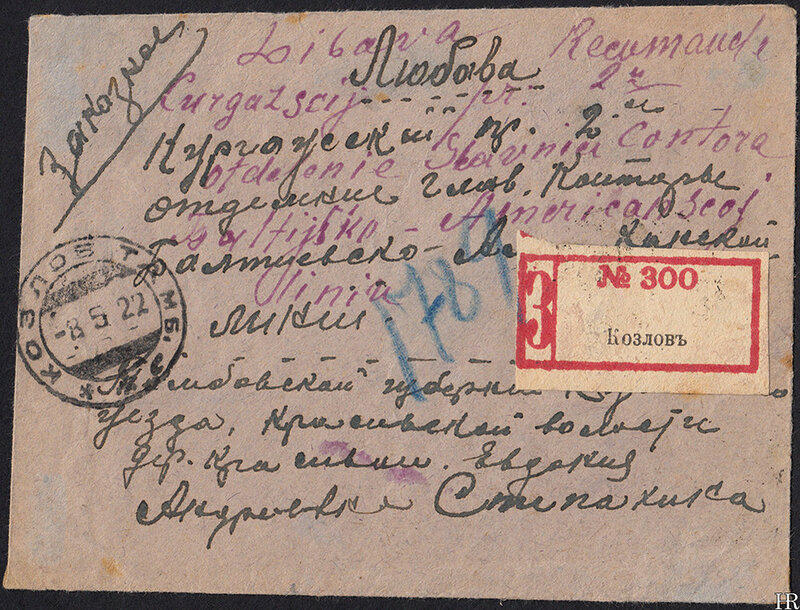 Registered letter (of slightly contorted shape) from Kozlov (now Michurinsk) to Liepaja, Latvia. Posted on the 8th May 1922 and arrived on the 15th. This seemingly managed to get into the postal system despite being severely under-paid: the franking of 60,000 OR exactly meets the tariff of 1st April 1922 (30,000 OR for an international letter, an additional 30,000 OR for registration), but on the 30th April (per Karlinskii) the rates were increased again, to 200,000 OR for an international letter and 200,000 OR more for registration. The blue pencil on the front has the air of a postage due marking (if it's a currency notation it presumably indicates a deficiency of 1789 Latvian kapeikas, which seems a reasonable —albeit very precise— sum vis-à-vis the denominations contemporary Latvian stamps were issued in), but my knowledge of Latvian postal matters is non-existent. Fedotowsky records the 1st Aptil tariff as continuing until the 20th May, so by his reckoning this letter is franked correctly. This is of course a neater explanation than there being a big under-payment, but the pencil on the front really feels like a postage deficiency to me. I leave this open for the moment. Note also that the sender seems to have omitted to write the address in Latin letters — this appears to have been added later by a different hand. Registered letter from Tiraspol (now located in either Moldova or Transdnistria, depending on your preference) to Berlin, posted on the 24th May and arriving, via Moscow, on the 10th June. The recipient, a Dr Brender, appears not uncommonly as the addressee of covers from this period — he seems to have been involved with some relief organisation or other. Anyway the cupboard was bare at the post office when the time came to send this letter — instead of stamps we have a signed note from the postmaster on the reverse, stating that 40 roubles in 1922 money (that is, 40 DR) was paid to cover postage. 40 DR was equivalent to 400,000 OR, which was exactly the rate for an overseas registered letter at this time. Why the Moscow postmark on the reverse is blue I do not know. The small red handstamp on the bottom-right corners is I assume a collector's mark — expertiser marks are generally somewhat less obtrusive. Regular letter to Berlin posted in Moscow on the 19th July. From April 1922 certain of the Tsarist stamps were reprinted and put on sale at considerable multiples of their face value: the values of kopeck stamps were multiplied by 1,000,000 and the values of rouble stamps by 10,000 (so, highly perversely, a 1 kopeck stamp was good for 10,000 OR, and a 1 rouble stamp was also good for 10,000 OR, notwithstanding that the rouble designs had a higher face value, were larger and were considerably more complicated to print). Anyway we have here a franking of 40,000,000 kopecks or 400,000 OR from the kopeck stamps, and an additional 50,000 OR from the 5 OR stamp, for a total of 450,000 OR. This is one of the periods where the authorities differ on the rates: under Karlinskii this date falls into the 30th April tariff (200,000 OR), and under Fedotowsky it's the 1st July tariff (45 DR or 450,000 OR). So Fedotowsky seems to be correct in this case. I think the stamp placement here is perhaps worth briefly noting: the two stamps on the front are enough to meet the old 200,000 OR tariff — did the sender forget the rates had gone up a couple weeks earlier and have to go back to add the extra stamps on the reverse? Pleasingly grotesque franking on a letter from Dashev (now Dashiv, Ukraine) to Berlin. Posted on the 1st August, it reached Moscow on the 7th of August and arrived at Berlin at... some point — very unusually there's no arrival postmark on this that I can see. The applicable rate was 90 DR or 900,000 OR (45 DR for an international letter and another 45 DR for registration), and here this has been met by the careful application of 120(!) 7,500 OR stamps, totalling 900,000 OR exactly. These stamps were distributed in sheets of 100 (four panes of twenty-five each), so more than one sheet got used here: note also that the topmost group on the reverse comprises five stamps from one pane and fifteen from another. That the Bolshevik-designed stamps were never perforated is generally regarded as a mark against them (both at the time and now), but that at least facilitated sticking them together in large combinations, something very regularly rendered necessary by inflation. The top two scans are the letter as it was folded up for transmission, and the bottom two are the thing fully unfolded (at 50% size for my own convenience). Astute readers will note that this is not, in fact, a cover, but it's slightly interesting nonetheless. 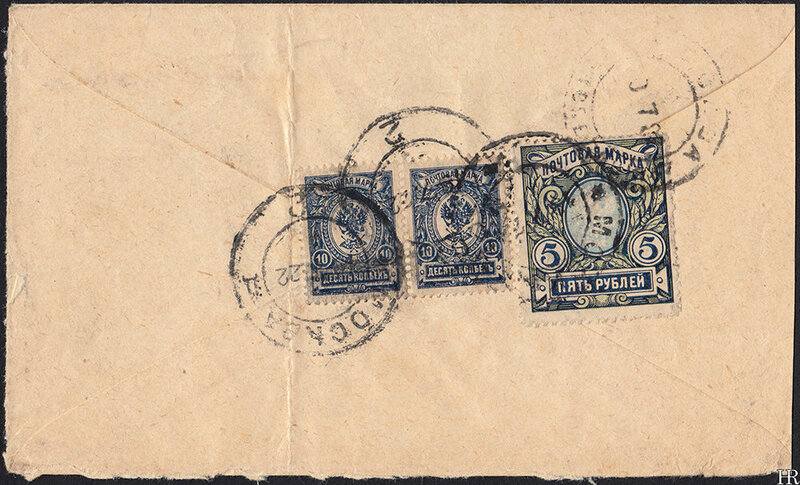 A fragment of a letter posted at the Motovilikha works in Perm on the 26th November 1922 — this seemingly isn't the entire franking as the stamps here total 66 DR, which seems never to have been the rate for anything (could be a registered intercity letter overpaid by 16 DR, as an outside chance). Anyway here we have two 27 DR stamps of the October Revolution fifth anniversary issue rubbing shoulders with a Tsarist 2 kopecks and 10-kopecks-on-7-kopecks. The latter hadn't been produced since early 1917 but apparently the government printers found a stack of them when they were clearing out their stocks in April 1922 and they were distributed to post offices in the normal fashion. Registered letter from Mstislavl (now Mstsislaw, Belarus) to Bern, Switzerland. Posted on, as far as I can make out, the 2nd December 1922 and arriving at some point later that month (the Swiss arrival postmark is unfortunately cut off). This cover is a good example of why, ideological considerations aside, postal clerks tended to prefer the Tsarist stamps to the Bolshevik ones: quite simply you could fit more of them onto an envelope. Here we have a franking of 300 kopecks, treated as 300,000,000 kopecks or 3,000,000 OR. 3,000,000 OR was equivalent to 300 DR, which was the rate for an international registered letter under the tariff of 1st November 1922 (150 DR for the letter and 150 DR on top for registration). Regrettably this has been reduced a little at the top, but presumably that was highly necessary to actually get this one open. The DR seems to have been introduced around the start of 1922, but it took some time before postage rates were expressed in it (Fedotowsky reckons this happened on the 1st July). The Rossica journal is, in general, a goldmine of valuable, completely disorganised information.